The Women’s Premier League (WPL) has wrapped on its 10th regular season, and the match-ups for the national championship are now set. San Diego won the Blue Conference and will advance to the semifinals with Glendale, and Red Conference leader Twin Cities will vie for the title alongside New York. The New York vs. Beantown game held the most weight, as the victor would secure a berth to the national semifinals. It took 13 minutes, but Beantown lock Stacey Bridges crossed for the first try, which inside center Kimber Rozier converted. Five minutes later, with a player advantage, New York sent prop Jessie Ruiz into the try zone, and flyhalf Kristen Siano converted to tie it up 7-7 for the rest of the first half. 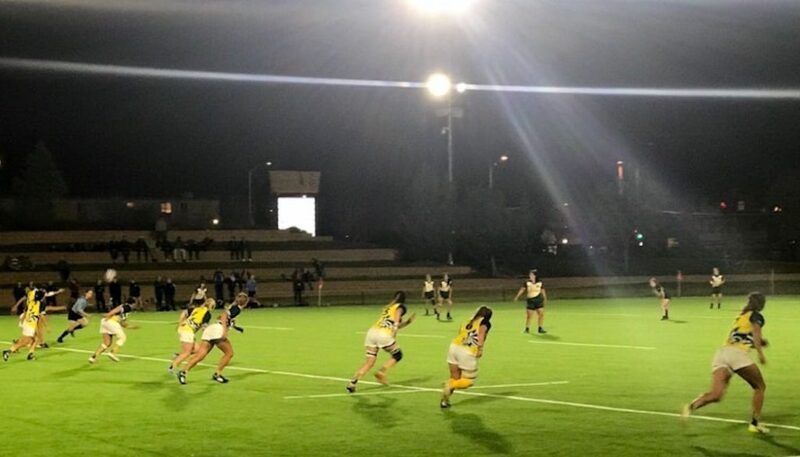 The visitors tacked on two more tries in the third quarter, courtesy of lock Alycia Washington and scrumhalf Carly Waters, And Siano’s extras gave New York a 19-10 edge. Beantown fullback Kelli Smith made it a one-score game, 19-15, with a try, and there the scoreboard sat for the next 10 minutes. Salomon also called out newcomer Caoihme O’Sullivan Roche, who came off the bench and injected new life onto the pitch for a strong finish. New York held on for the 24-15 win and berth to the national semifinals. Also in the Red Conference, Atlanta defeated D.C. 64-7 at home, a week before the field relocates to Marietta, Ga., for nationals. The Rugby Weekend-bound Cortney Kuehl and Kaitlyn Broughton scored two tries apiece, as did fullback Lara Gartner. Mo Compito, Chi Chi Chukwueke, Naiomi Cayo-Nelson and Pat Neder added five points apiece, while Corinne Heavner kicked seven conversions. Lauran Glover accounted for the Furies’ try and Kristen Maxey the conversion. Atlanta finished third in the Red Conference and will play Blue Conference #3 Berkeley during the first round of nationals. There was a bit less drama in the Blue Conference, as San Diego and Glendale had already claimed final four spots, but the Merlins’ game did occur in unique circumstances. The team hosted Chicago North Shore on the newly laid turf field outside of Infinity Park, where the HSBC USA Women’s 7s tournament was occurring. “Getting to bring this energy over from the tournament was so amazing and an honor, and a special way to cap off the season,” Glendale wing Nichole Wanamaker said. Under the lights, and with the buzz of international rugby still in the mountain air, Glendale beat North Shore 85-12. Of the 12 try-scorers, Wanamaker was the only one to feature in the try zone twice and was joined by Gabby Cantorna, Hannah Stolba (who also kicked 10 conversions), Christen Suda, Joanna Kitlinski, Amandine Chatelier, Madison Slaught, Kristine Peterson, Melissa Finklestein, Denali Graham, Rachel Ehrecke and Julie Tordonato. Chicago North Shore kept it interesting in the second quarter as Charli Jacoby and Brittany Simunac dotted down back-to-back tries, and Kat Stanley’s conversion made it 35-12 at one point. “I think the only time we did fail and they really had their tails in the air was when we failed to be disciplined. It was still on us when they scored those two times Wanamaker said. “When we ran our pattern, we ran it well, and I think it really showed on the scoreboard, too. San Diego won the Blue Conference after a 44-7 win over ORSU, and as the top seed will face Red Conference #2 New York during day one at nationals. Megan Foster led all scorers with 14 on two tries and two conversions, while Teigan MacDonald, Kate Zackary, Sam Pankey, Nicole Burr, Alexa Scott and Tiffany Tate also crossed the try line. Adrienne Acosta scored the Jesters’ try, which Karissa Postula converted.